Of the eleven species of Satyridae found in Britain we have identified five here at Quoditch. The Satyridae are also known as the Browns because the majority of them have a ground colour of brown on the upper side of the wings as well as eye spots. 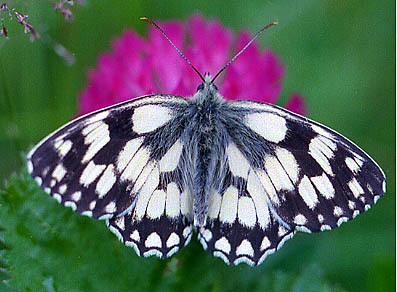 The exception to this rule is the Marbled White. They are the most specialised group of butterflies. They have developed further than other groups from the common ancestors of moths and butterflies. They are able to walk on four legs and often have a swollen edge of scent scales on the front edge their forewings. 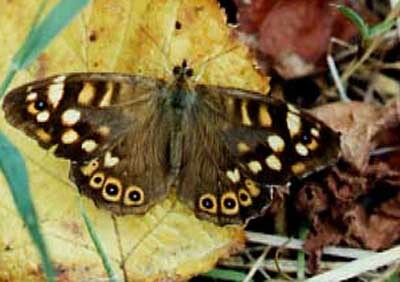 This is one of our favourite butterflies, and, in 2000 appeared in most of our fields. It is a very elegant butterfly, with a fluttery flight. Ours are mainly cream and chocolate in colour and appear a lot richer than this top view. They seem to know their calendar well and usually appear on July the first, although in 2003 they were a few days early. Hover your mouse over the picture for a moment. 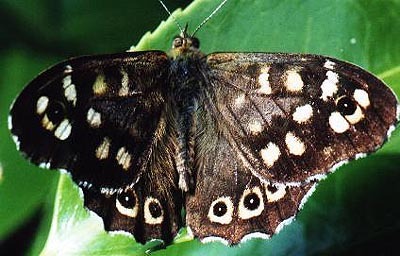 The Speckled Wood prefers dappled sunlight. We often find them in the woods and the Ride as well as in the fields. At one time it was called a Wood Argus. It is unique in that it can overwinter either as a chrysalis or as a caterpillar. This means that there are two distinct batches of butterfly each year with a small gap in late June/ early July, the first coming from the winter chrysalids and the second from those that overwintered as a caterpillar. Each year during that gap time we have found isolated species of larger butterflies with very predominant marks. So different that, at first, we thought we had a different species. It looks very much as though the males of the second brood appear earlier than the females and this is what we were seeing. (Beaufoy, 1953). This one can be found in Southern England, Ireland, Wales and in Scotland (possibly in colonies that were cut-off during the Ice Age). This is the most common butterfly of all. This one is a female, the male is darker. At Quoditch this one appears in late June and is around until August. At times the air in field four is thick with these and Ringlets, a really fascinating sight. This one is a female, the male has a darker underside. Also a different side view. 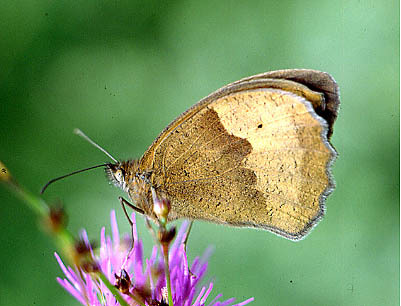 At first this butterfly can easily be mistaken for a Meadow Brown, but a careful look at the forewing will show that it has two white spots in the black eye, whereas the Meadow Brown only has one. This one is a female. 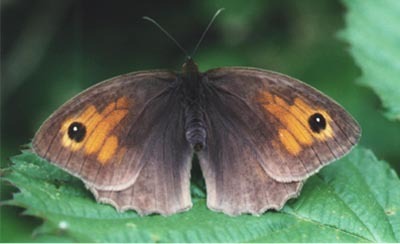 The males have a dark band of scent scales in the middle of the forewings. Again taken in August . The gatekeeper overwinters motionless as a caterpillar in grasses. Quite common in the South of England it is rarer in the North. But here is an interesting puzzle. This butterfly has two spots , so it should be a Gatekeeper. 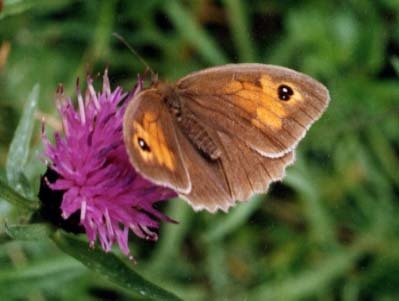 But if you look at the patterns on the wings you will see that you are looking at a Meadow Brown. 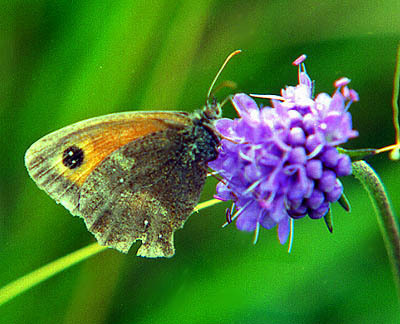 According to the Reader's Digest book of Butterflies you can occasionally find a Meadow Brown with two eye spots and, we believe, this is what we found here in August 2003. There were other sightings elsewhere in Devon that year as well. In August 2007 we received an e-mail from Bill Wren reporting sightings on the Tarka trail near Bideford. The spots seemed slightly more pronounced than the one at Quoditch. John Randall tells us that these are more prevalent in Scotland and are still uncommon in Devon . Roger Lane has seen them in the past in Cornwall and, coincidentally, spotted one on Cubert Common ( West Pentire) just after Bill had written to us. Roger suggests that previous discussions had put this occurrence at about one in several thousand. What he has noticed also over the years is that the double spot variety appear to tuck their fore-wing down inside the hind-wing, such that the white spots become invisible, much more rapidly than the one spot variety. Could they be aware of their differences? 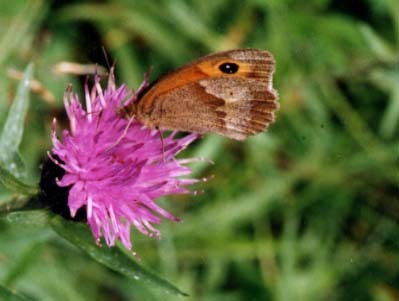 In April 2009 Nicholas Grey from County Wicklow wrote to us to say that two spot Meadow Browns are locally very abundant there and that Gatekeepers are very rarely seen. We have a lot of these right throughout the season from mid June to August. They appear on the brambles and nearby grasses, notably in fields one and four. 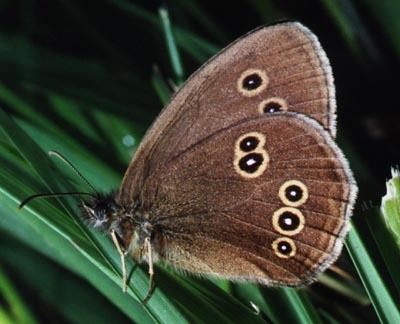 Ringlets like damp areas and will even fly in rain. They also fly until quite late into the evening. Ringlets drop their eggs anywhere without attaching them to anything. Their caterpillars lie low in the stems of grasses and climb them at night to feed. The male is almost black. BEAUFOY, S. & E.M. (1953) - Butterflies of the Wood, Collins, London. BRISTOW, C.R., MITCHELL, S.H. & BOLTON, D.E. (1993) - Devon Butterflies, Devon Books, Tiverton. BROOKS, MARGARET (1991) - A Complete Guide to British Moths, Jonathan Cape, London. STERRY, Paul 1995 - A Photographic Guide to Butterflies of Britain and Europe - New Holland, London. PORTER, Jim (1997) - The Colour Identification guide to Caterpillars of the British Isles,Viking, London.